America's residential real estate has hit a new high water mark, thanks to the jaw-dropping $195 million price tag on a Beverly Hills estate. The Palazzo di Amore, or "Palace of Love," has become the most expensive home listing in the country. Real estate mogul Jeff Greene is selling the estate after buying it for $35 million in 2007, according to The Wall Street Journal. So what accounts for the jump in price? Greene told The Journal that he invested $25 million in the home, which he described as a shell when he purchased it. Of course, a significant influence on the price might be the surging fortunes of the top 0.1 percent of American earners, whom have seen a dizzying rise in their wealth and income. The richest Americans are back at the heights of wealth last seen during "The Great Gatsby" era, economists Emmanuel Saez of University of California, Berkeley and Gabriel Zucman of the London School of Economics recently found. With the burgeoning bank accounts of the country's wealthiest, that's driving up prices in the luxury real estate segment. Luxury residential prices across 33 cities now stand more than one-third higher than in 2009, compared with an only 14 percent rise for all other real estate, according to the Knight Frank Prime Global Cities Index. 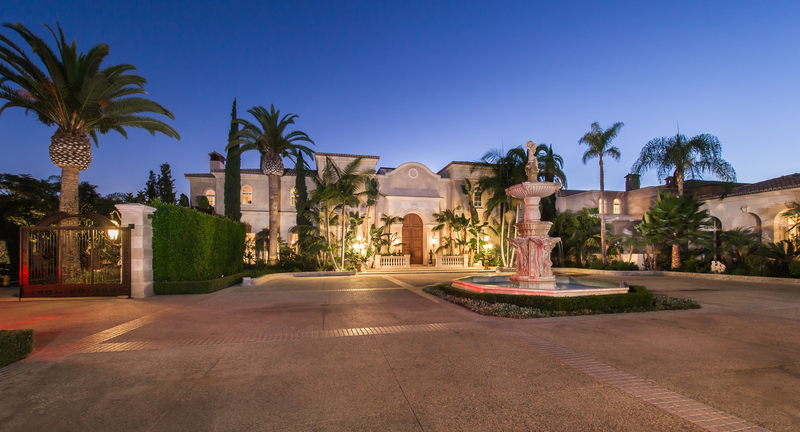 The Palazzo di Amore's price tag was settled on after its agents, Joyce Rey and Stacy Gottula of Coldwell Banker Previews International, compared the property to sales of smaller estates in the $100-million range, the agents told The Journal. So what will the buyer receive for $195 million? After traveling through three sets of double gates, the new owner will pass by "vast, stunning vineyards" and a "breathtaking waterfall." The home itself offers 12 bedrooms, 23 bathrooms, and rooms such as a breakfast room, a game room, an office and family room. The dining room has "intricate multi-colored marble inlaid floors, extravagant molding details and groin vault ceilings." A wine cellar holds 10,000 bottles and barrels, including vintages from the estate's vineyard. The home also includes a Turkish-style spa and "showroom-quality walk-in dressing rooms." A 15,000-square-foot entertainment complex includes a DJ booth and a laser-light system. The house, located two miles from the Beverly Hills Hotel, has parking for 150 cars and can host 200 guests at a sit-down dinner, according to the listing.